The Commissary Department: Best Job in the Army? A Soldier from the US 11th Engineers guides a British tank as it unloads from a train in October 1917. All unloading was done at night under near blackout conditions except for shielded night lights. I have been so busy trying to finish the "Model Railroad Goes to War" book, that I didn't have time to do a Merry Christmas Greeting for my blog readers. I hope you had a Merry Christmas and will have a Happy New Year. The book is almost done. I hope to get back on the Aquia Line soon. This is a massive diorama project executed in 1/35 scale by a single individual. It is comparable to a large model railroad project but without the trains. 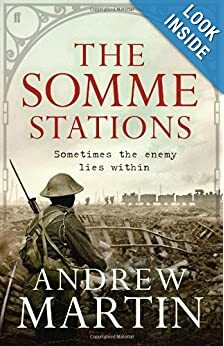 I have ordered his books, but they haven't arrived yet. His web site gives a pretty good idea of the scope and detail of the project. It is worth a look. 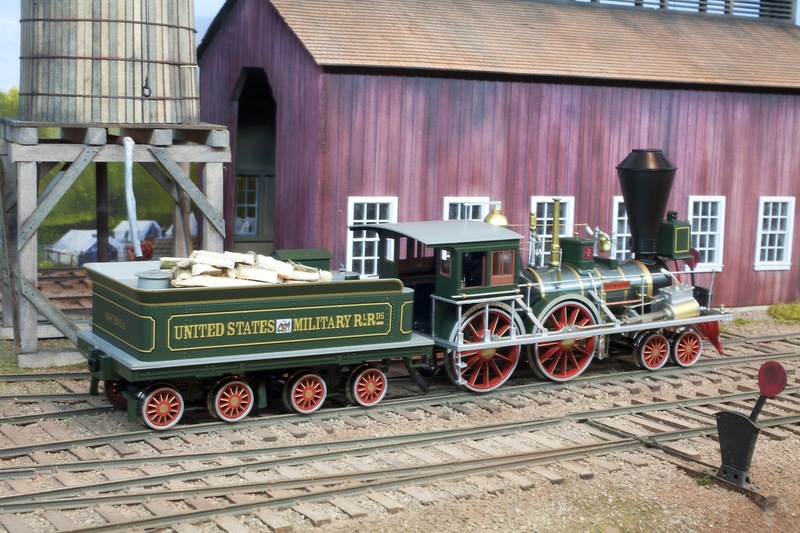 Before I started the 1/48th scale ACW RR project, I seriously considered building my ACW RR in 1/32nd scale. It would have been to Gauge 1 standards. To get started I had a copy of the Andreas Models General locomotive. It was a highly detailed static model of the engine. I also started to collect 1/32 wheel sets and other items. This effort was cut short when Dave at SMR trains introduced his line of locomotives. So I sold the 1/32nd locomotive model to a fellow in Brazil via ebay. 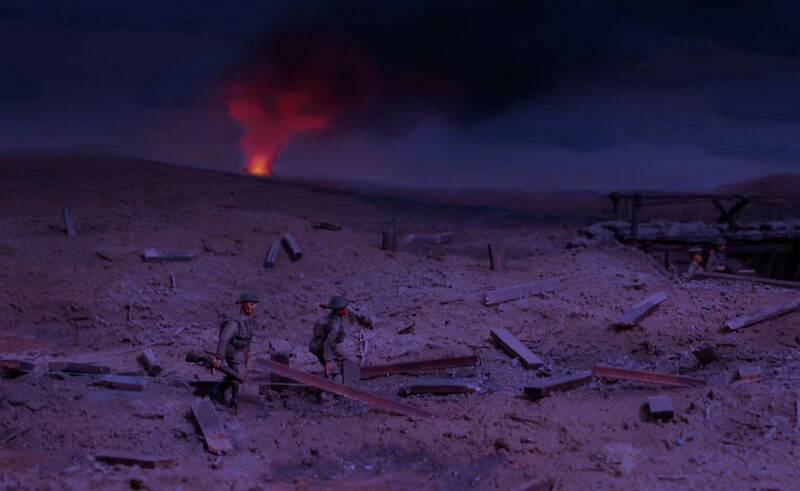 I do miss the beautiful 1/32nd scale figures that are available in that scale. Can you imagine the Potomac Creek bridge in Gauge 1! There recently was a long discussion on the Civil War Railroads Yahoo group about layout planning. 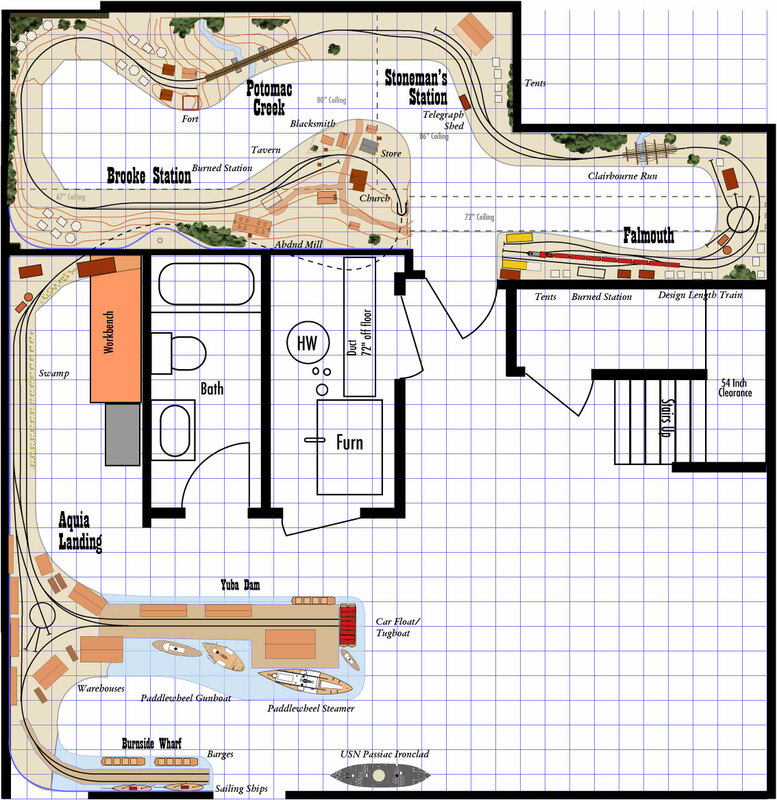 I thought I'd share my layout planning process here too. I am not suggesting everybody do it this way, but you might find it interesting. It is the system that served me well over the past 20 years and thousands (no exaggeration, I have four note books of track plan ideas, plus unknown scraps of paper) of track plans. When I am working on the overall concept for a track plan, I tend to use pencil and graph paper, though napkins, pizza boxes, backs of envelopes, crayons, and bloody finger tips have occasionally been used too. Sometime I will draw the available space on my computer showing walls and a grid and print multiple copies. Then I use it to sketch possible track plans in pencil. For plans that will be published I use Adobe Illustrator with a Track Plan plug-in written by Rick Johnson, one of Kalmbach's staff artists. It is available on line if you want to get it. With these two pieces of software you can generate publication quality track plans. This combo has some CAD like attributes, but it is more a drawing program and not a true CAD package. There is a bit of a learning curve, but not as bad as true CAD. I have found that if you can make the parts fit with the Track-Plan plug in, it will fit when you go to actually build it. That is because the plug-in uses very generous dimensions for turnouts based on ARA standards, while many model RR turnouts are built to compressed standards. Therefore, once I have a conceptual pencil sketch on paper, I like to draw my intended plan with Adobe Illustrator to make sure things will fit. I frequently find that my pencil drawings are usually too enthusiastic and some cut back in the design usually happens. Here is a typical example of a completed plan. Once in a while I will make a 3D sub-scale model of the plan like this. But, to paraphrase Helmut von Moltke the Elder, "No plan survives contact with wood and plaster." Even with the computer aided plan, I invariably find that adjustments are needed as I actually build the plan in 3D as it takes shape. Once the track is down and scenery started, I go back and update the drawing to the "as-built." Work has been progressing steadily on the book. I am very pleased with how it is coming along. Hopefully work on the Aquia line can restart next month. In the meantime, check out this video of a very elaborate UK exhibition layout. One thing I find interesting is how much infrastructure this layout entails. It is quite a job to move it to a show. I also wonder much much simpler the electronics would have been with DCC. 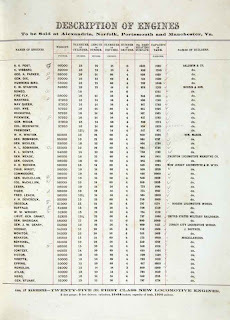 The NY Times Disunion series had a good article on commissary operations in the civil war. It is worth checking out. Chris in his layout in progress. On Saturday after the Great Scale Model Train Show JB Wielepp, JD Drye, Brian Brendel and I visited Chris McCheseny and his HOn2 layout. 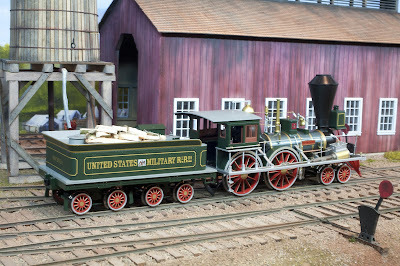 Chris is well known in Maine narrow gauge modeling as the builder of the WW&F waterfront modular layout and other models. Chris is continuing to work on the WW&F with a home layout that is designed for moving. He and his wife plan to eventually move and take the finished layout with them. He models in HOn30 and he scratchbuilt or rebuilt most of the locos. 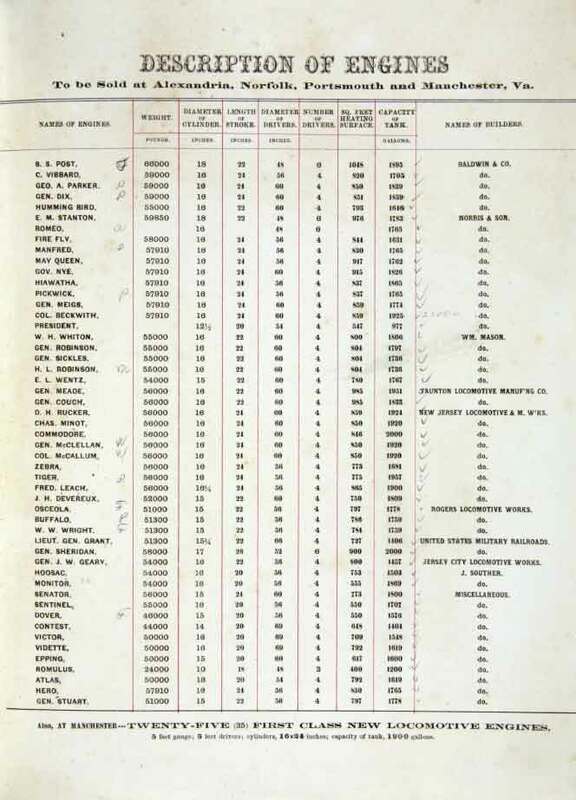 Along with the Narrow Gauge in the Sheepscot Valley series, in 1997 he wrote a book called the HOn30 Locomotive Handbook that describes most of his techniques. Jeff Bissonnette rebuilt the WW&F #7 and #9 to be equalized. Chris finished up the rebuild and painted them. Other locos Chris scratch built. The key to modeling in HOn30 is building locomotives that run reliably. Chris seems to have solved that issue with some absolutely amazing models. 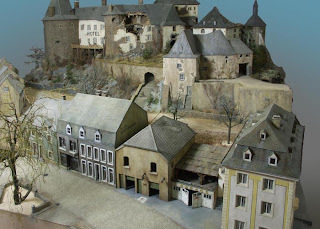 Jeff Bissonette documents some of his work on his blog and it is a must see if you are interested in fine scale engineering. The WW&F is one of my favorite railroads. I dedicated a chapter to it in my first book on mid sized layouts. 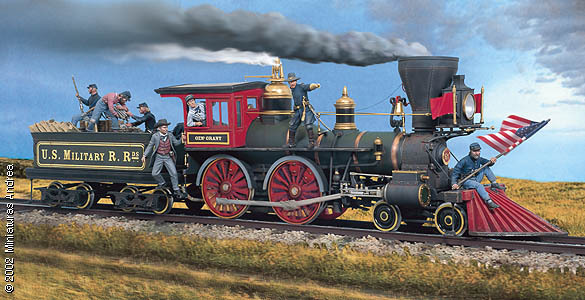 I plan to build a 4-4-0 in the future and I would like to try an equalized chassis. I hope to learn more about this in the future. Gerry and I displayed the McCook's Landing layout at the NMRA MER 2013 Regional Convention. This year they called it the C&P Junction. It was a great show. We had lots of folks see the layout and nearly everyone seemed to enjoy it. Our biggest fan was probably Wayne Matthews from Fredrick, MD. He was a second grader who spent a good part of Saturday along with his dad, Herbert "Matt" Matthews, watching the trains run on McCook's Landing. Wayne's favorite prototype railroad is the narrow gauge loop at Busch Gardens. But at the show he liked McCook's Landing the best. He wasn't the only one that liked the layout. The NMRA Judges awarded the Biscuit Run Section the First Place Module Award (due to the somewhat arcane NMRA contest rules, Gerry was only permitted to enter one section, Biscuit Run, in the contest. We could not submit the whole layout for voting). 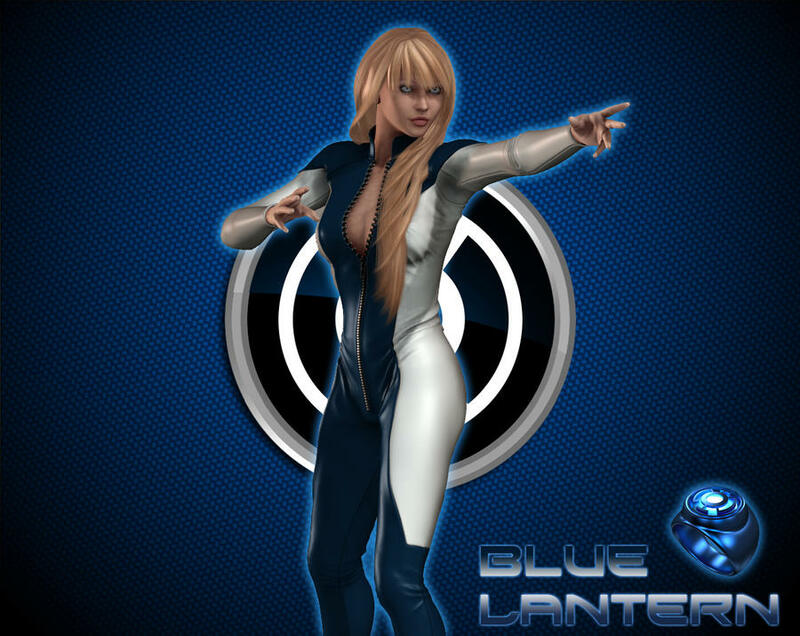 Is this the Blue Lantern? Blue Lantern Award here is the official description, "The Blue Lantern is privately sponsored and chosen by long time MER modeler Terry Nesbit and his Narrow Gauge Car Shop. The Blue Lantern is given to a model best representing branch or private line equipment or facilities, which contain no more than forty (40) percent commercial parts. The prize—a genuine railroad lantern—is presented to the winner by Mr. Nesbit." Gerry took the lantern home to display. We did not host any formal op sessions at the show. We just ran the trains in display mode. We got about 4 hours service out of the battery on Whiton. The Fury did not take a full charge and only lasted a few minutes. I need to look into why that happened as it ran fine at home. 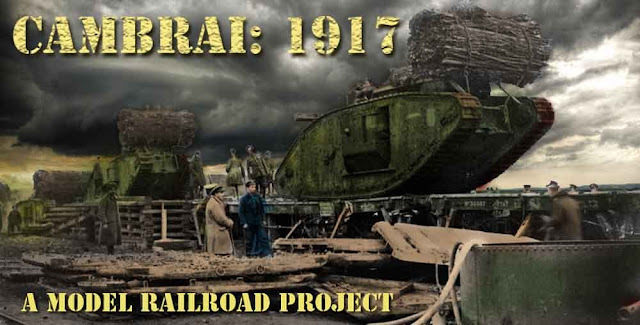 I presented two talks at the meet, "Intro to RRs of the Civil War" and a layout update on the USMRR Aquia Line, McCooks Landing and a sneak peek at the WWI layout, "Cambrai 1917." One of the things I really enjoyed at the show was meeting lots of other modelers. I heard a lot of interesting stories from folks. We in the DC area are blessed with an amazing array of talented and smart people that do great work. It was fun to learn some of their stories. On Sunday we had an informal open house. Gerry Fitzgerald, Doug Gurin, Paul Dolkos, Bernie Halloran, and Neil Besougloff stopped by for a lengthy visit. Both Bernie and Neil were first time visitors. I put Bernie, Gerry and Doug to work. Gerry made duckboards, Bernie glued down grass clumps and Doug made fascines for the tanks. 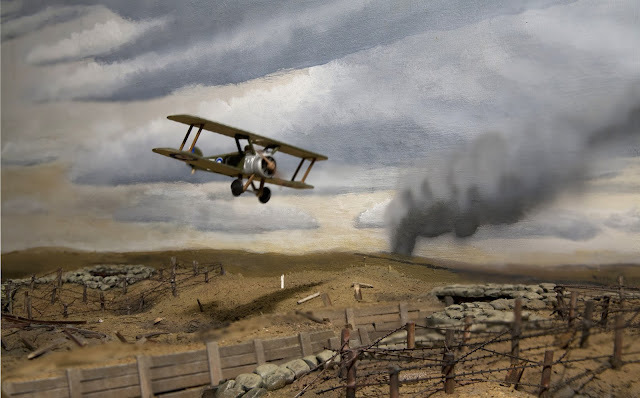 This was all for the WWI layout. I love seeing other Bernie's, as the name is kind of rare these days. I rarely get to say, "Hi, Bernie." I hadn't seen Bernie H since Granddad's hobby shop closed about 6 years ago. It was fun to catch up. Neil is the editor of Model Railroader Magazine. He got a chance to run the layout. Neil likes sports cars so we talked cars as well as trains, rapid prototyping and other topics. Alicia made brownies and everyone got their share, plus some to take home. Last weekend Ramon Rhodes and his wife Barbara visited the layout. Ramon lives in DC area, though he and Barb are both from NY. We had a fun visit. They both a chance to run some trains. 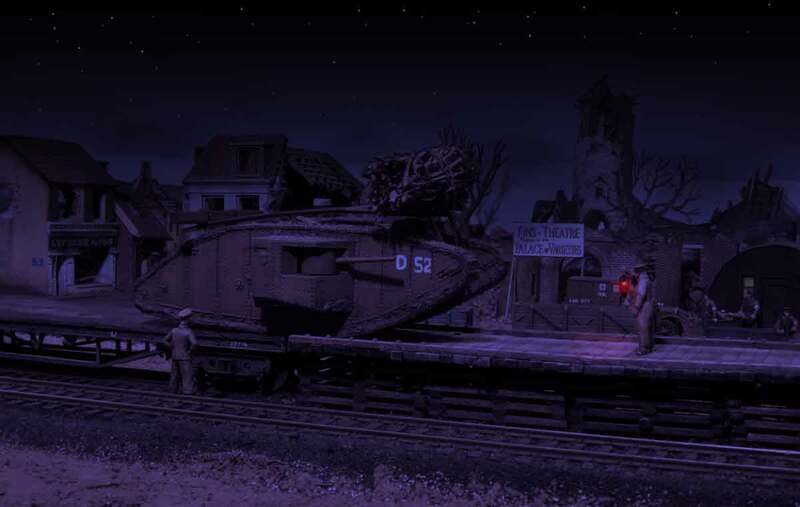 Ramon specializes in modern prototype railroads, but he is also known to dabble in 1/35th military models. Barb would like to build a garden railroad at some point. On Monday Charlie Getz and his wife Margaret visited the USMRR Aquia Line. Charlie is the current President of the NMRA. He models in HO. They were in town for the MER Convention and then are heading to an RPM meet. Last weekend I lead a tour group to the B&O Museum. The kind folks at the museum opened it early for the group so for two hours we had the place to ourselves. The museum provided tour guides, so I was able to wander around and soak in the atmosphere. It brought home to me how magical that museum is. The 4-4-0 Mason was in the shop for a boiler rebuild. In its place was a late 1860s era Winans Camel engine number 305. See photo above. 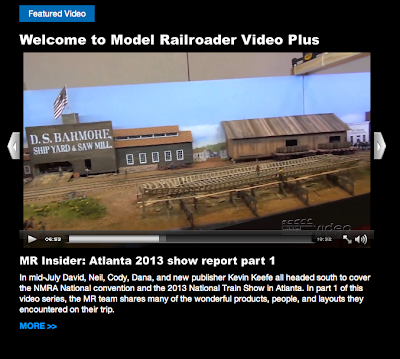 Model Railroader Magazine included a brief video look at the ACWRRHS SIG room at the 2013 NMRA Convention. Here is a link, BUT,---- You have to be a MR Video Plus Subscriber to view it. They have now also made the video available to MR Extra Subscribers at this link. Here are some screen caps from the video. I have had some time to digest the events of the past week and offer the following thoughts. I really enjoyed participating with the ACWRRHS, as we have known each other for 5 years now and are becoming good friends. I spent most of the show in our SIG room. This was our first event where we participated as part of a larger NMRA event. 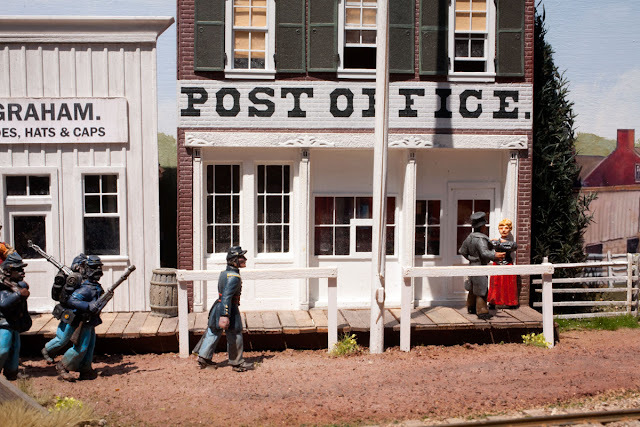 I think we were successful in showing that the Civil War era is a viable subject to model in N, HO and O scale. 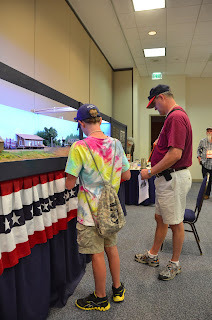 In some ways it was a perfect storm as we were in Atlanta with our ACW display during the 150th Anniversary of some of the biggest events in the war, and the NMRA offered a separate Civil War track of clinics and tours. unexpected that they would not be interested in converting. I saw only one person I would say was under twenty visit the room, and he was really enjoying the layout. I gave him a throttle so he could try some operation. Time will tell if we have any new interest in our subject based on this show. Even if we did not recruit new members, it was nice being part of the NMRA convention. It presented the opportunity to distract us with clinics, contest room and layout tours. I didn't see too many clinics that appealed to me, but it was nice to have the option to sit in on one if desired. For example Jim Elster's marathon scenery clinic had some good tips. 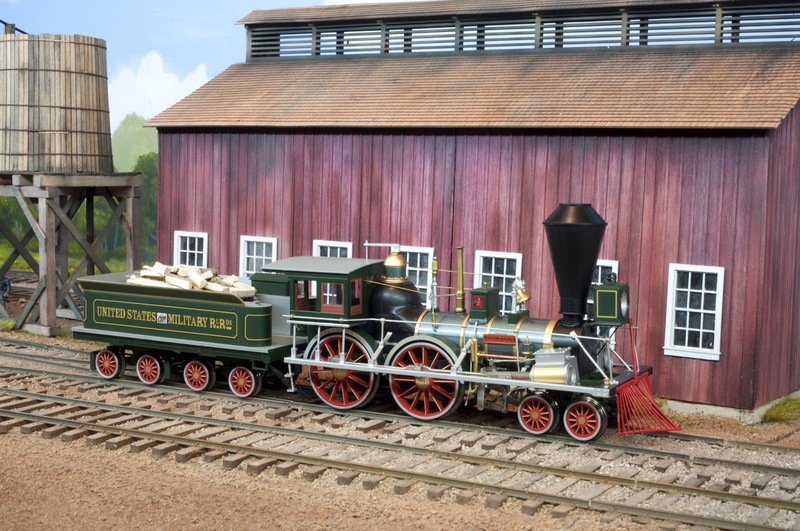 It was good to again see John Wilkes talk about his layout as his layout is built with aluminum channel and it as close to the Hadron Collider as a model railroad can come. John Bopp and Dave Hoffman presented some excellent talks to just the ACWRRHS. They were good enough that they could have been presented to the whole convention. Dave Hoffman talked about some hand-built brass models he plans to offer for sale. He is looking for reservations and deposits. I made a brief video showing some of his pilot models running on a test track. Dave lives in a rural area of Mississippi and does not have reliable internet access. So please contact Al Mueller at the ACWRRHS Yahoo Group if you are interested. I went to three layouts on the way home on Saturday and all were impressive. Phillip Stead has a large On3 model of the DRGW from Chama to Alamosa. Steve Austin has a finely crafted On30 freelanced railroad set in Appalachia. Finally I visited Gerry Holmes in Chattanooga to see his layout. Gerry is a client of mine and I have built several custom buildings for him. With regard to the McCook's landing it operated very well with just a few problems. We had six crews operate it. They took between 45 to 120 minutes to complete the switching tasks. I had put a prohibition on using the front coupler and that complicated their tasks somewhat. It was gratifying to see that the link and pin couplers were accepted without complaint. They operators seemed to get into the challenge and actually enjoyed it. I had a little glitch with the cassette tracks interface with Biscuit Run. I forgot to account for the 1/8th inch thickness of the sky board that created a gap in the rails. I need to fix that before the next show. But it was amazing to watch the trains traverse a 1/8th inch gap in the rails. Ah, the advantages of O scale. Other than that the cassettes worked well. It was handy having a shelf to place stuff too. I also liked how the fiddle yard breaks down to a flat box and fits snugly in the transport truck. The batteries on the locos held up pretty well. We learned that they could sustain about 3.5 hours of operation before conking out. That is entirely acceptable. The slow speed performance was excellent. The layout suffered only minor damage. As one who has built many N Scale modules over the years, I know you have to expect some damage when you take portable layouts to shows. But in this case, the integral valance and lights helped protect the layout. Only a few figures vibrated loose during shipment. One figure lost its head, that was a surprising but minor issue. 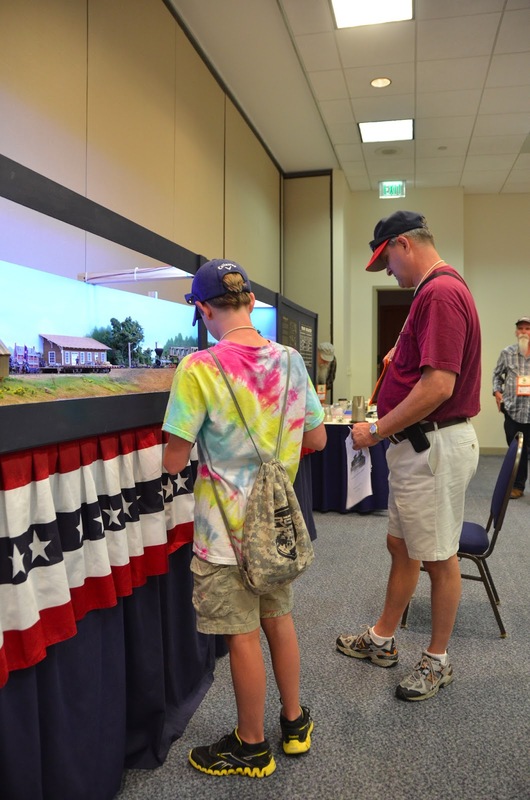 I was personally gratified by the positive response of nearly everyone that visited the layout. Most were extremely complimentary. Several African American visitors expressed appreciation for our depiction of the USCT on the layout. I was able to connect with Robert West, a railroad artist. He is launching a series of Civil War related paintings and asked if he could consult with me on ideas. That should be fun. Steve Benezra wants to do an article on ACW operation of the OPSIG journal. The MRH folks had a chance to operate the layout. They posted detailed coverage on their blog. They even posted a picture of me, a rare thing as I am usually behind the camera. (When you see my picture you will know why). McCook's Landing was also the subject of a video interview with the MRH Trainmasters-TV program. This video production looks like it has all the right ingredients to be a winner. I will be looking forward to it. I attended the train show on Friday morning. It had the usual assortment of vendors and manufacturers. I didn't spend a lot of time there and didn't see anything so extraordinary that bears reporting. Just one observation, manufacturers are making some incredibly detailed models these days. I usually come back from these shows charged up to build more layout. But I need to temper (curb?) my enthusiasm as I have some other projects I must complete first. I will focusing the next few months on my next book entitled "The Model Railroad Goes to War." That will cover the ACW, WWI, WWII and modern eras. As I was unloading the layout I noticed that the sun shine made for some interesting lighting. So I took a few shots. Here is an example. I hope to start back on my home layout in December by finishing Aquia Landing. I eagerly anticipate that as I think it is going to be a lot of fun to build. In the meantime, I'll be posting less frequently on this blog as construction on my ACW layouts will be slow. But I will come back big guns in December. I'm back from the NMRA Convention safe and sound. I had a great time and will be posting a more detailed report later. We ran six "official" Op sessions. They went really well. My thanks to all that participated. All were very gracious. I didn't hear one complaint and I saw a lot of smiles. Thanks also to my fellow ACWRRHS SIG members for their help in unloading, setting up and taking it down. Also, Paul Dobbs was very gracious as he provided security for the ACWRRHS Room for almost the whole convention. I think the ACWRRHS SIG had the best display at the con. We were practically the only group to bring any trains. Members of our group also gave a number of talks on the ACWRRing. Of these, the talks I went to were well attended. I didn't get to too many clinics as I was tending to the road show. (L to R) John Bopp, Rob Hinkle (Conductor) and John Bazzaitas ran the first op session. (L to R) Stephen Brooks (Conductor), Andy Keeney and Sam Shepherd were the second crew. (L to R), Seth Neumann (Conductor), Chuck Place and Ken O'Brien took the third session. They were very efficient and finished in 45 minutes. OPSIG Journal Editor Steve Benezra stopped by for a visit. (L to R) Dave Foster (Conductor), Bruce Faulkner and Mike Tylik ran the afternoon session on Thursday. 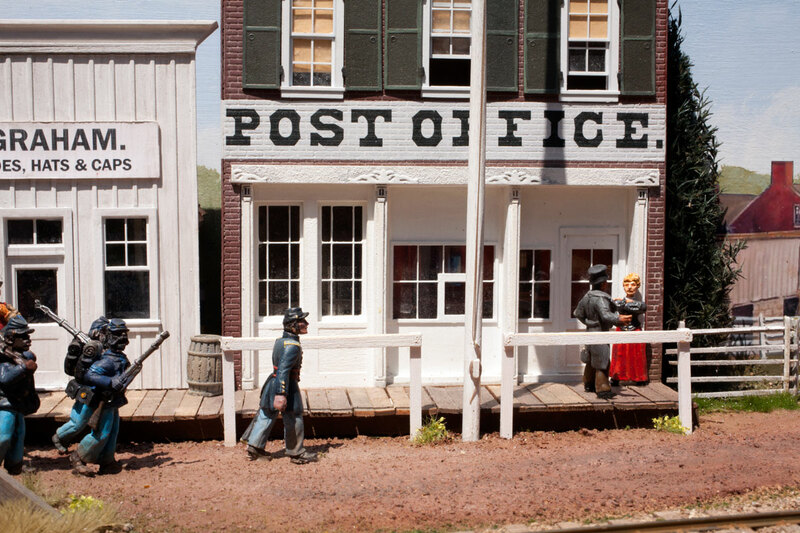 The staff from Model Railroader Magazine and Kalmbach stopped in for a lengthy visit. (L to R) David Popp, Neil Besougloff, and Kevin Keefe. (L to R) JF, Les Halmos, Joe Fugate (Conductor) and Patty Fugate ran the Thursday evening session. Patty was our only female operator. 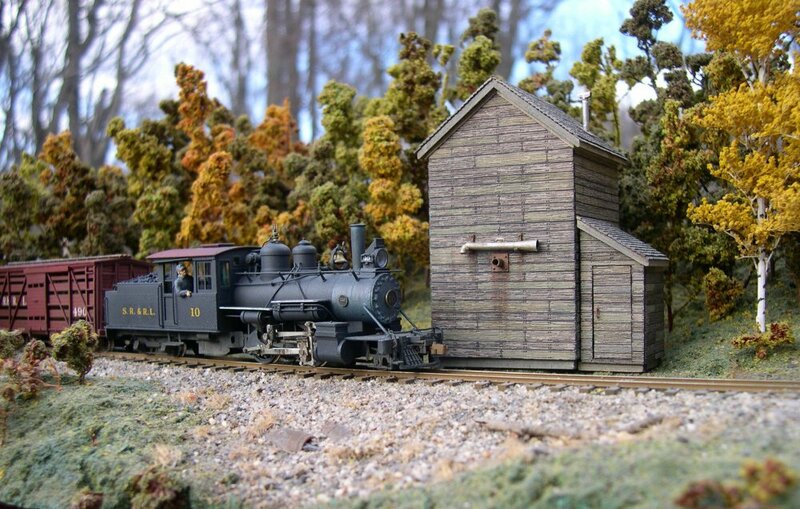 Joel Salmons poses by his N Scale civil war display layout. DC Cebula set up an impressive collection of prototype hardware and paper work. Paul Dobbs manned the slide show and information desk.